Royal Marine, Pen Farthing is making a difference in running the only recognized animal shelter in Afghanistan which not only rescues dogs and cats from the battlefields, but finds good homes for them as well. The stories associated with his efforts are heart-warming, Capra-esque tales as to how forgotten animals can be re-united with their soldier companions and/or their families in Afghanistan, as far north as Great Britain and as far west as the United States. The backdrop for this remarkable initiative began back in November, 2006, when the British Cammando Royal Marines landed in the war-torn town of Now Zad, the Helmand Province of Afghanistan. Their assignment was to provide stability for the local people during a period of ever decreasing security. In the case of Sergeant “Pen Farthing” however, he soon realized, it wasn’t only the local countrymen and women who needed their help. It was also the countless number of stray and abandoned pets who became homeless as a direct result of the war. Shortly after the town's namesake "Nowzad" was taken in, others soon followed. Strays like "RPG," "Jena," "Tali," "AK" and dozens more became the "founding canines" of Pen's make-shift shelter. These fortunate canines went from scavenging food one day to receiving two decent meals daily the next, courtesy of military rations donated by the British soldiers. From that meager beginning, a sizable charity grew to help with supplies, better shelter accommodations and transport means for many of these dogs to be united with their returning soldier companions. 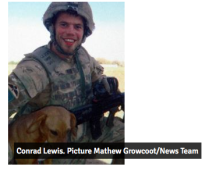 Conrad Lewis & PegasusOne of sadder cases that Farthing and the Nowzad organization had to address over the years pertained to paratrooper Conrad Lewis who adopted a stray mongrel he named "Pegasus." On the battlefield, Lewis was known to feed the dog from his daily meals, and the troops would talk about the two of them being inseparable. Unfortunately the 22-year service man did not live out his tour of duty. He was shot and killed by a Taliban sniper, leaving poor 'Peg' to mourn. Here is a poignant photo commissioned by Lewis' family of the dog pining over her master's uniform and battle-gear. Lewis however, loving this dog as he did made sure his family knew he wanted to bring her home after his tour. So, in a recent news update from the Coventry Telegraph, it was reported that Lewis' family were determined to honor his wishers and hatched a daring plan to smuggle Peg out of the country. With the help of the animal charity Nowzad and assisted by the Afghan police, Peg was hid in a dufflebag and was flown in an army helicopter to a dog shelter in Kabul, before connecting to another flight that transported her 3,500 miles to Britain. 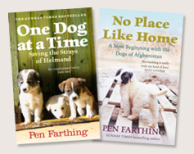 Today, the Nowzad charity continues to grow at a steady rate, and the dog "Nowzad" has now been immortalized in two books penned by Pen Farthing. "No Place Like Home," highlights the "new beginnings" for the dogs of Afghanistan," and "One Dog at a Time," describes the epic challenge of rescuing Afghan strays and either re-uniting them with their soldier mates, or finding them suitable homes, sometimes thousands of miles away. But Pen Farthing's work is far from done. In this video, he makes a fund-raising plea in his attempts to secure a new animal shelter (since the current lease on their existing shelter is about to expire). 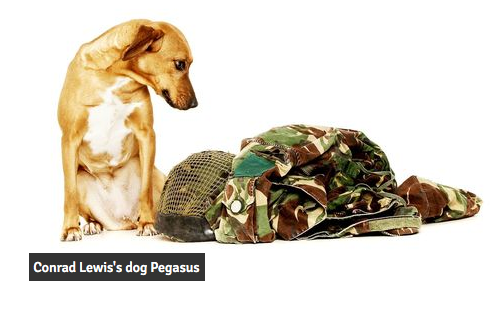 His goal is 100,000 British pounds to build a lasting legacy for animal welfare in Afghanistan. All the monies donated go directly towards helping the animals in need, while raising awareness of the problems that homeless animals, (in war zones), can and do face on a daily basis. Pen Farthing IS making a difference, but he needs our help and support in assuring that "no companion animal" he takes on, will be left behind. So, readers, if you can't make a cash donation, think about sharing this blog on all your social networks, in addition to checking in with Nowzad from time to time, on their Twitter and Facebook feeds. Cat Friend vs. Dog Friend 2 -- The Sequel Animal Video of the Day!!! Pug Sings "Batman" Theme! The Superhero Animal Video of the Day!!! Squirrel Snuggles! The Animal Video Of The Day!! !